July 25, 2016 – Mister Journalism: "Reading, Sharing, Discussing, Learning"
I voted for Mr Clinton. Once. But not twice. I voted for Mr Obama. Once. But not twice. Voters are entitled to just one principled practice: After careful, thoughtful consideration, cast a ballot for whomever they so choose. I am on a two-week vacation, driving cross-country with my wife to spend time with family in Seattle. In my absence, I have dug into the archives and pulled up some reruns for you. Though what I most suggest is that you check out the blogroll on the right side of the page. There are some outstanding bloggers, and if there are some folks you’ve never sampled, there’s no day like today. Teaching While Black has been problematic for decades. If we roll the clock back to the Brown vs. Board of Education, we discover a response that some folks have just forgotten all about. In the spring of 1953, with the Brown vs. Board of Education desegregation case pending in the U.S. Supreme Court, Wendell Godwin, superintendent of schools in Topeka, sent letters to black elementary school teachers. Painfully polite, the letters couldn’t mask the message: If segregation dies, you will lose your jobs. New research from Jason A. Grissom and Christopher Reddinglooked for new information to explain the underrepresentation of students of color in gifted programs. It’s complicated problem, but the researchers came up with one answer– white teachers are far less likely than teachers of color to identify students of color as gifted. (Consider this the second cousin of the finding that police view young Black men as older and less innocent than whites). Public ed supporters have at times wrestled with the support for testing in the social justice community. There are some hard lessons to be learned. No part of the ed refom agenda better demonstrates the trick of coupling a real problem with a fake solution. This Goes Under “Cashing In On Ed Reform” : K12 Inc.
K12 Online Learning is in Washington State using tax dollars to cash in on the online charter school industry. This was first published on the Seattle Education blog in 2012 and originally posted at Ed Week the same year but I think it’s time to bring attention back to this cash cow brought to you by ALEC. K12 Online Learning is in Washington State and using millions of tax dollars to advertise their enterprise. K12 also has a full time lobbyist haunting the halls in Olympia. 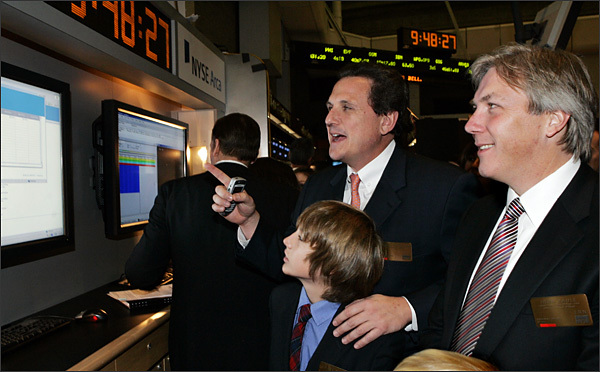 Ronald J. Packard, center, the chief executive of K12 Inc., and his son Chase celebrate the company’s listing on the New York Stock Exchange in 2007, along with John F. Baule, the chief operating officer of K12. Don’t they look happy. I don’t think they run them anymore, but I always kind of liked Capital One’s “What’s in Your Wallet?” campaign. My fondness for the ads might have something to do with the fact that Alec Baldwin and Samuel L. Jackson make excellent spokespeople. I’m just saying. Political Power of the Online Charter Czars: Can It Be Broken? Ohio’s Steve Dyer reports in his personal blog that defenders of Ohio’s Electronic Classroom of Tomorrow, the notorious ECOT online charter school, have even been lobbying delegates to the Republican National Convention here in Cleveland against Ohio’s crack-down on e-schools which seem to have been collecting millions of dollars every year from the state for phantom students. Dyer writes: “And now, the Ohio Coalition for Quality Education—the state’s ironically named and most egregious defender of poor-performing charter schools… slipped a letter under the doors of delegates to the Republican National Convention….” The letter “blames sneaky Democratic bureaucrats at ODE (Ohio Department of Education) for ECOT’s problems….” In fact, as Dyer explains, passage of a bill modestly to increase regulation of Ohio’s charter sector was passed with bipartisan support. But now, as Ohio’s largest and most profitable charter stands to lose millions of dollars because it has been inflating the per-pupil attendance on which state funding is based, powerful backers are appealing to anyone they can to try to keep their school operating and keep the tax dollars flowing into their profits. 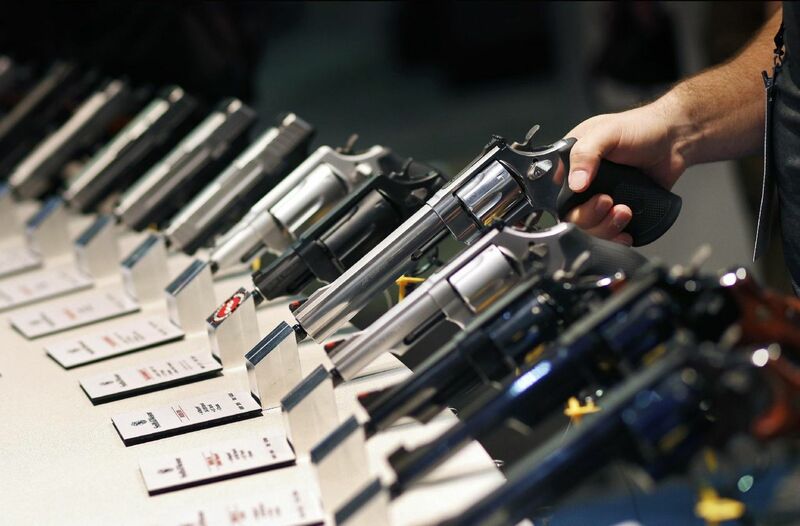 A New Gun Survey Has Some Good News And Some Not So Good News Too. My job, as I see it, is to deliver the news about guns to the Gun Violence Prevention community. I’d be happy to deliver the news to Gun-mob Nation as well, but they don’t seem very interested in what I have to say. Or I should say that if Gun-mob Nation is interested, it’s just to tell me that whatever I have to say isn’t what they want to hear. But occasionally I also have to tell my GVP friends some news that they would rather not hear. But that’s my job. According to Chalkbeat Colorado, Denver is set to strip 47 teachers of their tenure because they received two consecutive ineffective ratings. The state law passed in 2010 called S. 191 requires that teachers be evaluated annually, with student scores counting for 50% of the teachers’ ratings. The law was written by State Senator Michael Johnston, who spent two years as a Teach for America recruit. Johnston predicted that his law would cause every teacher, every principal, and every school in Colorado to be “great.” There is no evidence that it has had that effect. — Twenty-eight of the 47 teachers set to lose tenure — or 60 percent — have more than 15 years of experience. Ten of those teachers — 21 percent — have 20 years or more of experience. — The majority of the 47 teachers — 26 of them — are white. Another 14 are Latino, four are African-American, two are multi-racial and one is Asian. — Thirty-one of the 47 teachers set to lose tenure — or 66 percent — teach in “green” or “blue” schools, the two highest ratings on Denver’s color-coded School Performance Framework. Only three — or 6 percent — teach in “red” schools, the lowest rating. — Thirty-eight of the 47 teachers — or 81 percent — teach at schools where more than half of the students qualify for federally subsidized lunches, an indicator of poverty…. Debbie Wassermann Schultz announced her resignation as chair of the Democratic National Committee. During the campaign, Senator Sanders called for her resignation and said the DNC was not playing fair. The leak of emails proved him right. Her departure should signal more than just a change at the top. It should open a much-needed discussion of the neoliberal policies that many national Democrats shared with the GOP. The bipartisan consensus on critical issues should be reconsidered. The party must take a clear stand against fracking, against privatization of the public schools and other public services, against trade deals that hurt working Americans, and for stronger protections for college students, the environment, and the 99%. Regulations of banks must be strengthened to prevent a repeat of the 2008 economic meltdown. Democrats must begin here and now to renew their commitment to social justice, economic fairness, and promotion of the common good. The blurring of the lines between the two parties is nowhere more obvious than in the Democrats’ support for school privatization and high-stakes testing. Historically, these are Republican issues. Democrats must listen to the experts in every field, the people who do the actual work, not the think tanks in D.C., not the hedge fund managers, not the financiers, and rebuild the trust of their base.